Erythromycin is a medically important antibiotic, biosynthesized by the actinomycete Saccharopolyspora erythraea. Genes encoding erythromycin biosynthesis are organized in a gene cluster, spanning over 60 kbp of DNA. Most often, gene clusters encoding biosynthesis of secondary metabolites contain regulatory genes. In contrast, the erythromycin gene cluster does not contain regulatory genes and regulation of its biosynthesis has therefore remained poorly understood, which has for a long time limited genetic engineering approaches for erythromycin yield improvement. We used a comparative proteomic approach to screen for potential regulatory proteins involved in erythromycin biosynthesis. We have identified a putative regulatory protein SACE_5599 which shows significantly higher levels of expression in an erythromycin high-producing strain, compared to the wild type S. erythraea strain. SACE_5599 is a member of an uncharacterized family of putative regulatory genes, located in several actinomycete biosynthetic gene clusters. Importantly, increased expression of SACE_5599 was observed in the complex fermentation medium and at controlled bioprocess conditions, simulating a high-yield industrial fermentation process in the bioreactor. Inactivation of SACE_5599 in the high-producing strain significantly reduced erythromycin yield, in addition to drastically decreasing sporulation intensity of the SACE_5599-inactivated strains when cultivated on ABSM4 agar medium. In contrast, constitutive overexpression of SACE_5599 in the wild type NRRL23338 strain resulted in an increase of erythromycin yield by 32%. Similar yield increase was also observed when we overexpressed the bldD gene, a previously identified regulator of erythromycin biosynthesis, thereby for the first time revealing its potential for improving erythromycin biosynthesis. SACE_5599 is the second putative regulatory gene to be identified in S. erythraea which has positive influence on erythromycin yield. Like bldD, SACE_5599 is involved in morphological development of S. erythraea, suggesting a very close relationship between secondary metabolite biosynthesis and morphological differentiation in this organism. While the mode of action of SACE_5599 remains to be elucidated, the manipulation of this gene clearly shows potential for improvement of erythromycin production in S. erythraea in industrial setting. We have also demonstrated the applicability of the comparative proteomics approach for identifying new regulatory elements involved in biosynthesis of secondary metabolites in industrial conditions. Actinomycetes are an evolutionary diverse group of bacteria, predominantly soil-inhabiting organisms with GC-rich genomes and complex life cycles. Most actinomycetes are characterized by mycelial growth, multicellular behaviour, complex physiological and morphological differentiation and highly regulated biosynthesis of secondary metabolites with a broad spectrum of biological activities. Many of these natural products are of enormous industrial and clinical importance, e.g. as antiinfectives, anti-cancer agents and immunosuppressants. Soil-dwelling actinomycetes grow as vegetative mycelia of branching hyphae which explore the environment for available nutrients. When nutrients become scarce, for example after a few days of growth on an agar plate, aerial hyphae emerge from the colony into the air using the lysed vegetative mycelium as substrate [1, 2]. Typically, antibiotic biosynthesis is initiated at this time . Aerial hyphae then undergo several morphological stages, leading to subdivision of apical cells and finally to the release of spores . These differentiation steps as well as biosynthesis of bioactive compounds (secondary metabolites) are coordinated by the complex regulatory pathways, which have been so far mostly studied in model actinomycetes, such as Streptomyces coelicolor. Important roles of some of the identified genes in differentiation, predominantly genes with regulatory function, have been elucidated based on the classical genetic studies. The obtained mutants, deficient in differentiation mainly fall into two phenotypic categories: mutants with “Bld” (bald) phenotype, which fail to make aerial mycelium and the “Whi” (white) mutants, which can form aerial mycelium but cannot produce spores and the spore pigment (reviewed in ). Saccharopolyspora erythraea is an important filamentous actinomycete used in industrial fermentation processes for production of erythromycin, a medically important polyketide antibiotic. Semi-synthetic derivatives of erythromycin, such as clarithromycin and azithromycin, are widely used in clinical setting to treat infections caused by Gram-positive pathogens. In addition to its industrial importance, S. erythraea has been used as a model actinomycete system for studying the biosynthesis of secondary metabolites of polyketide origin, particularly the macrolide antibiotics, synthesized by modular type I polyketide synthase (PKS) genes [4, 5]. Basic structure of the erythromycin biosynthetic gene cluster was found to span over 60 kbp of DNA and to comprise 20 genes transcribed in four main polycistronic units . Three centrally located large PKS genes eryAI, eryAII and eryAIII, involved in the biosynthesis of macrolide core (6-deoxyerythronolide B), are flanked on both sides by the genes involved in post-PKS processing, biosynthesis and attachment of desosamine and mycarose sugar moieties to the erythronolide aglycone and erythromycin resistance [7, 8]. Reflecting its industrial and scientific importance, the genome of S. erythraea wild type (WT) NRRL 23338 strain has been sequenced recently . With the aim of achieving higher erythromycin productivity and fermentation processes scalable to industrial-scale bioreactors, the WT strain and the corresponding bioprocess have been improved for decades mainly by iterative methods of random mutagenesis and selection, resulting in industrial high-producing strains [9, 10]. Due to very high industrial importance of erythromycin, the efforts towards improved S. erythraea strains are continuing by genetic/metabolic engineering as well as classical methods, assisted by genomic and transcriptomic approaches [9, 11–13]. In most actinomycetes, timely and coordinated expression of large genetic clusters for polyketide biosynthesis, essential for efficient biosynthesis of the corresponding bioactive compounds, is achieved by several levels of regulatory control. First, pleiotropic (globally acting) regulatory genes, link signals from the environmental stimuli and life cycle progression to the biosynthetic machinery of the strain. Pleiotropic regulators are thought to activate transcription of pathway-specific regulatory genes, most often located inside biosynthetic gene clusters . Pathway-specific regulators, such as the SARP (Streptomyces antibiotic regulatory protein) family regulators or the LAL (large ATP-binding regulators of the LuxR family) family regulators [15–17] then coordinate transcription of the biosynthetic genes most often located inside the corresponding clusters. In several actinomycetes engineering of regulatory mechanisms has shown a promising potential for increasing yields of natural products . In some cases pathway-specific regulatory genes, naturally present in the biosynthetic gene clusters, have been overexpressed using strong constitutive promoters. In one example, overexpression of tylS and tylR regulatory genes in WT as well as in industrial overproducing strains of Streptomyces fradiae resulted in a significant increase in yields of tylosin, a macrolide antibiotic structurally related to erythromycin . Similarly, yields of the immunosuppressants rapamycin and FK506 have been successfully increased by overexpression of the pathway-specific regulatory genes rapG (and rapH) in Streptomyces rapamycinicus and fkbN in Streptomyces tsukubaensis, respectively [20, 21]. In striking contrast to the predominant regulatory cascade, present in most actinomycetes, the erythromycin gene cluster in S. erythraea does not contain pathway-specific regulatory genes, which has for some time precluded a better understanding of the regulatory mechanisms governing erythromycin biosynthesis. Importantly, microarray-based transcriptional studies revealed coordinated expression of most erythromycin biosynthetic genes and therefore the very likely existence of a common regulator for the ery cluster . It was later demonstrated that this function can be carried out directly by BldD, a global regulatory protein with a key role in S. erythraea morphological differentiation. BldD was found to bind with a high affinity to all five promoter regions of the ery cluster, and the inactivation of the bldD gene reduced erythromycin production 7-fold in the WT strain of S. erythraea. In addition, bldD inactivation resulted in the Bld phenotype , analogously to the better characterized role of the bldD orthologue in S. coelicolor[23, 24]. Based on a comparative proteomic approach and transcriptional analysis, carried out in the industrial cultivation conditions, we have identified a novel putative regulatory gene SACE_5599, which shows significantly higher expression levels in an industrial high producing strain of S. erythraea, ABE1441, compared to the WT strain. SACE_5599 is homologous to the putative regulatory genes located in several biosynthetic gene clusters of actinomycetes and its overexpression in S. erythraea NRRL23338 resulted in an enhanced erythromycin production (32% increased titre) at the shaker level, while its inactivation in the industrial strain led to significantly lower erythromycin yield, accompanied by a drastic reduction of sporulation on solid agar medium. Advancing our understanding of the regulation of erythromycin biosynthesis is of key importance as it will likely contribute towards increased efficiency of industrial fermentations of S. erythraea and potentially other industrial antibiotic-producing actinomycetes. In addition, this work demonstrates the potential of omics approaches for strain development in the industrial setting when analyses are carried out in industrially relevant conditions. Regulatory mechanisms that control S. erythraea life cycle and erythromycin biosynthesis remain poorly characterized, which limits the genetic engineering efforts towards improved strains with increased yields of erythromycin. Based on the genome sequencing data more than 1000 genes with putative regulatory function are encoded in the S. erythraea genome . However, their possible role in the life cycle or secondary metabolism is hard to predict based on the genome sequence alone. With the aim of identifying potential regulatory elements involved in regulation of erythromycin production during the fermentation process, we employed a comparative proteomic approach. We invested significant efforts to develop media from which high quality proteome and transcriptome data could be generated, at the same time ensuring relatively high yield of erythromycin, and maintaining key process conditions comparable with the industrial large scale fermentation process. Two S. erythraea strains, the WT NRRL23338 strain and an industrial erythromycin high-producing ABE1441 strain, developed from the WT strain through an intensive strain improvement program, were cultivated at 5 L bioreactor scale in medium and fermentation conditions simulating industrial fermentation process for production of erythromycin. In these conditions the NRRL23338 strain typically produces less than 100 mg/L erythromycin, whereas the ABE1441 strain produces approx. 2000 mg/L erythromycin (Figure 1). Representative samples of complete fermentation broths were collected at multiple time points during the erythromycin fermentation, cell-free protein extracts of S. erythraea were prepared and subjected to quantitative proteomic analysis. Relative quantification was performed using the spectral counting methodology, which compares numbers of detected MS/MS spectra for each of identified proteins . Relative expression of SACE _5599 and erythromycin biosynthesis of the WT and industrial high-producing ABE1441 strains. Data from one representative fermentation process are shown, normalized to expression of 16S rRNA. Grey lines represent relative expression of SACE_5599 ( ) and erythromycin concentration ( ) in the ABE1441 strain. Black lines represent relative expression of SACE_5599 ( ) and erythromycin concentration ( ) in the WT strain. In this way we aimed to identify regulatory proteins showing significant difference in expression levels at different stages (physiological conditions) of the fermentation process. It was our goal to obtain a small number of promising candidate regulatory proteins that could be further evaluated by gene inactivation and overexpression experiments with the final aim of increasing erythromycin yield through genetic engineering approaches. Interestingly, in addition to over 20-fold higher erythromycin yield achievable by the industrial strain, the WT and ABE1441 strains also differ significantly in intensity of sporulation on the ABSM4 and R5 agar media (Figure 2; Additional file 1), similarly to what has been previously observed for other erythromycin high-producing strains . The high-producing strain ABE1441 showed abundant sporulation on ABSM4 agar plates (used in this study for inoculation of liquid media) whereas the NRRL23338 sporulates poorly and only after prolonged cultivation period. Phenotypes of S. erythraea mutants with inactivated or in trans - overexpressed SACE_5599 on ABSM4 agar plates containing apramycin: A) NRRL23338/pSET152; B) ABE1441/pSET152; C) ABE1441/ΔSACE_5599 complemented with SACE_5599 (pABE110; pABE112); D) ABE1441/ΔSACE_5599 (pABE110); E) ABE1441/pSET152 + SACE_5599 (pABE104) F) NRRL23338/pSET152 + SACE_5599 (pABE104). Construction of plasmid constructs is presented in Table 1. Equivalent result was observed when plates without apramycin were used (not shown). Among the proteins differentially expressed at the time of intense erythromycin biosynthesis (35 h for the WT and 27 h for the ABE1441 strain), SACE_5599 was identified as the putative regulatory protein with the most prominent difference in expression levels when comparing the industrial and WT strains. In fact, peptides derived from this protein were undetectable in protein extracts of the NRRL23338 WT strain, whereas several peptides of the SACE_5599 protein showed relatively high abundance in samples of the industrial ABE1441 strain (Figure 3B, Additional file 2). Genomic context and amino acid sequence of SACE _5599. A) Chromosomal locus of SACE_5599. Genes located close to SACE_5599 and their putative functions are indicated. SACE numbers are indicated above the arrows. SACE_5596 encodes a hypothetical protein with no similarity to other proteins in sequence databases. The position of SACE_5599 in S. erythraea genome is schematically represented. The »core« region is marked with bold grey line and the »non-core« region with thin black line. B) Sequence of the 219 amino acid ORF of SACE_5599 with peptides detected in proteomic analysis underlined, conserved tryptophan residues marked in bold and the position of alternative translation start (184 aa variant) is shaded in grey. Based on these results it was our aim to investigate in more detail the putative regulatory gene SACE_5599 and its potential role in the regulation of erythromycin yield. Genomic analysis revealed that the SACE_5599 gene is located on the reverse strand at approx. position of 6.292 Mbp, inside the “non-core” region, believed to mainly contain genes related to conditionally adaptive functions . Nevertheless, SACE_5599 lies very close to the limit of the predicted “core” region of S. erythraea chromosome  and is located 2.7 Mbp away from the ery cluster on 8.2 Mbp chromosome, surrounded by genes with no apparent role in erythromycin biosynthesis or secondary metabolism (Figure 3A). Similarly, the bldD (SACE_2077) regulator of transcription of erythromycin biosynthetic genes is also encoded relatively far away from the ery cluster and is located close to the other limit of “core” and “non-core” regions in the circular S. erythraea chromosome (Figure 3A). Interestingly, both the SACE_5599 and bldD lie approx. 2 Mbp from oriC in opposite directions. Importantly, the genome sequences of NRRL23338 and ABE1441 are identical inside the ORF and putative promoter region of SACE_5599 as well as of the adjacent genes (ŠF, HP, GK - unpublished results). SACE_5599 ORF was originally predicted at the time of S. erythraea genome annotation , however, an additional upstream start codon can also be envisioned, resulting in the length of the ORF of 184 or 219 amino acids, respectively (Figure 3B). In addition to examining the genomic context, it was our aim to obtain more information about the possible function of SACE_5599 by identifying its potentially better characterized gene homologues in related bacterial species. A BlastP search  in the ‘nr’ database of NCBI identified a family of 29 thus far sequenced homologues with the E value < 10-5, nearly all of them located inside antibiotic gene clusters in the genomes of Actinomycetales. The length of predicted polypeptide chains of most homologues varies between 180 and 250 aa. The first member to be sequenced was the lmbU gene from the lincomycin biosynthetic gene cluster from Streptomyces lincolnensis. The lmbU gene contains a TTA codon in its nucleotide sequence and was therefore assigned a putative regulatory function . The TTA leucine-encoding codon is extremely rare in actinomycetes and is often involved in synchronized regulation of expression of differentiation and secondary metabolism-related genes through regulated expression of the corresponding BldA-tRNA . Sequence alignment of the homologues reveals a series of strikingly conserved tryptophan residues as well as numerous conserved arginine residues (arginine amounts to 14.2% of all amino acid residues of SACE_5599) in the N-terminal and central part of the protein (Figure 3B, Additional file 3). Theoretically predicted pI of the protein is 9.9, suggesting its possible function in nucleic acid binding. In addition, secondary structure prediction algorithms  predict a very high proportion of α-helical structure. Unfortunately, none of the homologues of SACE_5599 have been characterized so far at the biochemical or structural level, therefore little information is available on the roles and mechanism (s) of action of this family of proteins. Nevertheless, the notion of regulatory role of this family of proteins was further strengthened by gene-inactivation experiments of the novE homologue, located inside the biosynthetic gene cluster for novobiocin biosynthesis. When novE, also containing a TTA codon, was inactivated in Streptomyces spheroides NCIMB11891, the yield of novobiocin was reduced from 37 mg/L to 1.5 mg/L . Interestingly, the TTA leucine codon is not present in the sequence of SACE_5599. In the next step we decided to compare in more detail the expression of SACE_5599 gene in the WT and erythromycin high-producing ABE1441 S. erythraea strains. We carried out a bioprocess for production of erythromycin at the scale of 5 L bioreactors, closely resembling industrial conditions, and samples for RNA analysis were harvested every 2 hours. Performing qPCR with SACE_5599-specific oligonucleotide primers we confirmed that transcription of SACE_5599 in the WT strain was very low throughout the bioprocess duration, peaking at around 70 h. In accordance with the results of the proteomic analysis, the expression of this gene was up to 20-fold higher in the high producing ABE1441 strain, particularly at the later stages of the cultivation process (Figure 1). The observed differences in expression levels of SACE_5599 between the two strains suggest that this gene might be involved in the regulation of erythromycin biosynthesis of the ABE1441 overproducing strain and, possibly, also in the observed morphological differences between these two strains (Additional file 1). However, in order to establish whether there is a clear causative relationship between the drastically different expression levels of SACE_5599 and erythromycin yield we carried out the SACE_5599 gene inactivation in the industrial overproducing strain ABE1441. The pKC1132-based plasmid pABE110, containing 344 bp of the central region of SACE_5599 and not capable of replicating in S. erythraea was constructed and transferred into S. erythraea by conjugation from E. coli, thereby inactivating the putative regulatory gene by a single crossover gene disruption. The correct insertion through homologous recombination into the SACE_5599 locus and interruption of the ORF were confirmed by PCR and sequencing. 20 independent SACE_5599-inactivated ex-conjugants were obtained and all of them showed a morphologically modified phenotype, compared with the parent ABE1441 strain. On the ABSM4 solid medium, these mutant strains showed significantly reduced sporulation, which was also delayed for several days as compared to the original ABE1441 strain (Figure 2). Moreover, the mutant strains with inactivated SACE_5599 also produced substantially higher amounts of an unknown black pigment when grown on ABSM4 agar. Further on, we tested the obtained mutants for erythromycin productivity in laboratory scale (shake flask level). Inactivation of the SACE_5599 gene resulted in a significant decrease (37%) in erythromycin yield in these mutant strains, compared to the original ABE1441 overproducing strain, which produced approx. 2.1 g/L erythromycin under the cultivation conditions used (Figure 4). Clearly, the decrease in erythromycin yield was not as drastic as to drop to the yield observed in the WT strain (around 60–70 mg/L) despite a complete lack of SACE_5599 expression in the SACE_5599-inactivated strains. Therefore, it can be concluded that the effect of differential expression of SACE_5599 on erythromycin yield in the high-producing ABE1441 strain seems to represent one of several factors, which contribute to increased erythromycin yield and likely form a complex interdependent regulatory/metabolic network. At this point it is not possible to speculate whether SACE_5599 is directly involved in transcriptional regulation of the ery genes or the effect of SACE_5599 on efficiency of erythromycin biosynthesis is indirect, possibly acting through regulation of so far unidentified metabolic/regulatory pathways, intimately associated with the differentiation process. Yield of erythromycin produced by different mutant strains of S. erythraea. Bars encompass 95% of the sample population. Horizontal lines represent the median values and perpendicular lines indicate extreme values (min, max). Asterisks denote statistically significant differences between experimental group samples compared to control samples. The data were analyzed using SAS/STAT program as described in Methods. Panel A): Erythromycin production by NRRL23338 transformants, determined by the microbiological assay; WT: control 1 NRRL23338; A: control 2 NRRL23338 + pSET152; B: NRRL23338 + SACE_5599-219 aa (pABE104); C: NRRL23338 + SACE_5599-219 aa-HA (pABE106); D: NRRL23338 + BldD (pABE21). Panel B): Erythromycin production by industrial high-producing strain ABE1441 transformants, determined by the HPLC-UV method; ABE1441: control 1 ABE1441; E: control 2 ABE1441 + pSET152; F: ABE1441 ΔSACE_5599 (pABE110); G: ABE1441 ΔSACE_5599 + SACE_5599-219 aa-HA (pABE112) sporulating strains; H: ABE1441 + SACE_5599-219 aa (pABE104); I: ABE1441 + BldD (pABE21). Further on, it was our aim to evaluate whether overexpression of SACE_5599 in the WT S. erythraea strain can positively influence the regulatory network of the erythromycin biosynthetic processes and potentially lead to the phenotype more similar to the ABE1441 high producing strain, generated by strain improvement through random mutagenesis, thus leading to higher erythromycin yields and improved sporulation on ABSM4 agar medium. 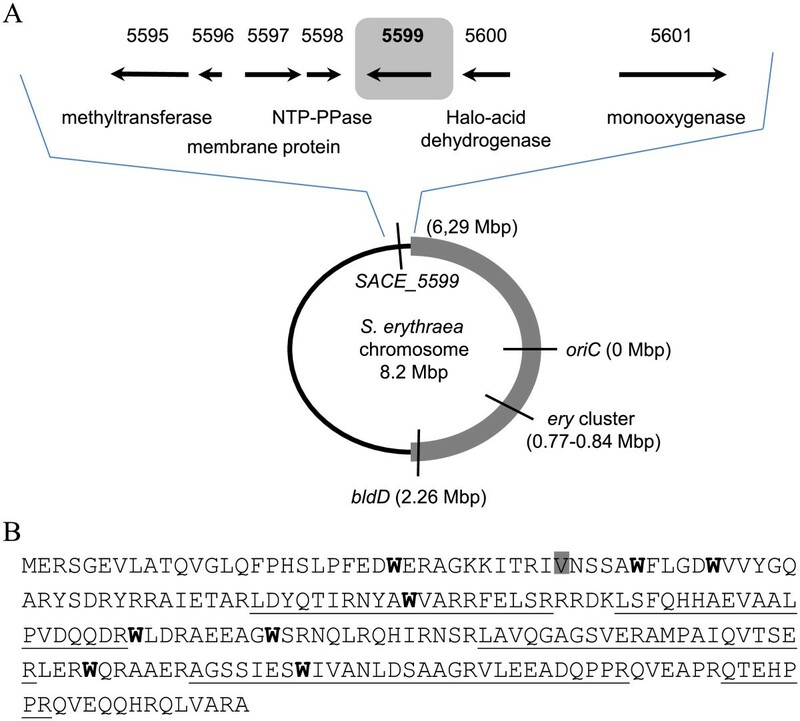 A set of pSET152-based expression vectors was constructed and used to integrate an additional copy of SACE_5599 in the S. erythraea chromosome. Relatively strong constitutive promoter PermE* was used in all cases to drive transcription in trans. As SACE_5599 has not been previously characterized or expressed in trans, eight different plasmid construct variants were prepared (Table 1). The variations were made in a) the 5’-UTR where variants with or without a ribosomal binding site (RBS) between the PermE* and the start codon were introduced, b) the SACE_5599 ORF to account for possible 184 aa or 219 aa ORF size, and c) the C-terminus of the protein where the HA-tag  was either absent or present, in order to be able to confirm the functional in-trans expression of SACE_5599 by western blotting. Each generated transformant was subjected to PCR analysis in order to confirm that the corresponding plasmid construct was integrated into S. erythraea genome by the action of ɸC31 integrase, encoded in the pSET152 backbone. Integration through homologous recombination into the native copy of SACE_5599 was not observed. 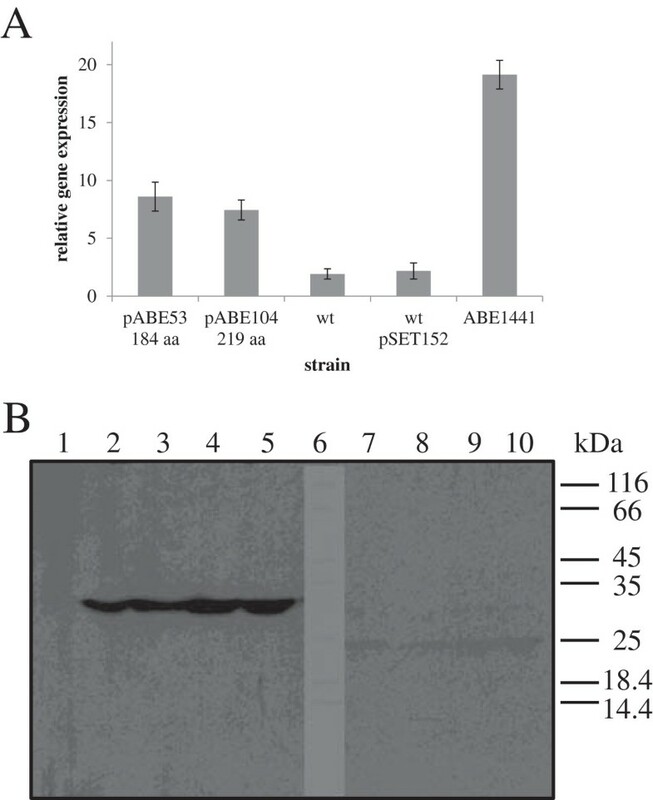 In addition to the NRRL23338 WT strain, the same plasmid constructs were also introduced into the high producing ABE1441 strain in order to evaluate whether further increase in erythromycin yield can be achieved (see next section). Site-specific integration with bacteriophage ɸC31 integrase is indicated for pSET152-derived plasmids; “/” refers to “none or not applicable”. The obtained transformants of the NRRL23338 strain were then cultivated in shake flasks. In order to evaluate the suitability of the used vector/promoter system, cultures were sampled after 72 h of cultivation (estimated time of intense erythromycin biosynthesis in shake flasks) and SACE_5599 transcript levels were evaluated in strains transformed with different plasmids by qPCR. As shown in Figure 5A, qPCR analysis revealed significantly increased transcription levels in the transformants, constitutively overexpressing either 219 aa or 184 aa variant of SACE_5599, compared to the WT strain. Interestingly, transcription levels in transformants of the WT strain (with the second copy of SACE_5599 in trans under PermE* promoter) were still relatively low compared to the levels observed in the industrial high-producing ABE1441 strain, also determined in this qPCR analysis (Figure 5A). In order to confirm functional expression of the SACE_5599 protein, cell free protein extracts of the transformants with HA-tagged variants of SACE_5599 were subjected to western blot analysis. Importantly, we could detect strong specific bands of apparent molecular mass of (33 kDa) only in the samples in which longer variant of the gene was constitutively expressed, either without (pABE106) or with RBS (pABE107) in the 5’-UTR of the transcript (Figure 5B). In contrast, the bands corresponding to the shorter 184 aa variant (expressed from plasmids pABE102, pABE103) were observed at the molecular mass of 25 kDa but were very faint suggesting extremely low expression level. This suggests that the 219 aa variant of SACE_5599 protein is likely physiologically relevant. We hypothesize that the shorter 184 aa polypeptide variant might fold much less efficiently into a stable three-dimensional structure and is more rapidly degraded. Further on, similar intensity of the bands was observed in all 219 aa transformants, regardless of whether 5’-UTR with or without RBS was used (Figure 5B). The estimated molecular masses of both HA-tagged variants are slightly larger than their theoretically calculated values, possibly due to the very high pI of SACE_5599. Evaluation of in-trans expression of SACE _5599 in S.erythraea. A) qPCR analysis of expression levels of SACE_5599 (normalized to expression of 16S rRNA) in WT and strains with additional copy of SACE_5599 (pABE53, pABE104), compared to the ABE1441 high-producing strain. B) Western blot analysis of in trans expression of 219 aa (lanes 2–5) and 184 aa (lanes 7–10) SACE_5599-HA and the control NRRL23338 strain with pSET152 (lane 1). Molecular mass markers were loaded in lane 6 and their positions are schematically presented on the right side of the blot. Bands of apparent molecular mass of 33 kDa are observed in 4 independent 219 aa transformants of the NRRL23338 strain, two containing the RBS sequence (pABE107) in the expression vector (lanes 2–3) and two without the RBS sequence (pABE106) (lanes 4–5). A very weak band of apparent molecular mass of 25 kDa was observed when shorter variant (184 aa) of SACE_5599 was expressed, either without RBS (plasmid pABE102 – lanes 7 and 8) or with RBS (plasmid pABE103 – lanes 9 and 10). In the next experiment, erythromycin yield was determined in fermentation broths of the NRRL23338 strain transformants containing in trans copy of the longer 219 aa variant of SACE_5599 (plasmid pABE104) after 7 days of cultivation. Transformants containing the plasmid pABE106 with the HA-tagged version of SACE_5599 for which high overexpression was confirmed by western blot, were also included in the analysis. Erythromycin yield of the WT-based strains was determined by the microbiological assay based on Bacillus subtilis growth inhibition (see Methods), considering that at low erythromycin concentrations (below 200 mg/L) the erythromycin present in the broth cannot be reliably quantified by the used HPLC method. Indeed, erythromycin yield in SACE_5599 overexpressing strains was increased on average by 32% (Figure 4) compared to the WT level and addition of HA-tag to the C-terminus did not significantly influence the effect of SACE_5599 overexpression. It is noteworthy that the yield increase as well as observed expression levels of SACE_5599 are relatively low, although we used the constitutive PermE* promoter, which has previously been demonstrated as relatively strong promoter in S. erythraea. Nevertheless, in this way we have clearly demonstrated a positive influence of SACE_5599 overexpression on erythromycin yield in the WT strain. In parallel with in-trans expression in the NRRL23338 WT strain, we also introduced the 219 aa version of the gene SACE_5599 into the ABE1441 high producing strain, as well as into the SACE_5599-inactivated mutant of ABE1441. Interestingly, when SACE_5599 was over-expressed in trans in the high producing ABE1441 strain, using the plasmid pABE104, the yield of erythromycin was not significantly increased (Figure 4), suggesting that the underlying regulatory mechanisms have already been optimized (improved) in this industrial strain through random mutagenesis and selection procedures. Further on, one of the 20 SACE_5599-inactivated strains of ABE1441 high producing strain (see above) was complemented with the longer 219 aa variant of the gene. In this case, a thiostrepton resistance cassette was added to the pABE106 vector, which was used for selection, because the apramycin resistance marker is already present in the plasmid used for inactivation of the native SACE_5599 copy (Table 1). Normal sporulation phenotype, observed in the parent ABE1441 strain, was restored in about 80% of the ex-conjugants, which had SACE_5599 disrupted strain and then complemented in trans. 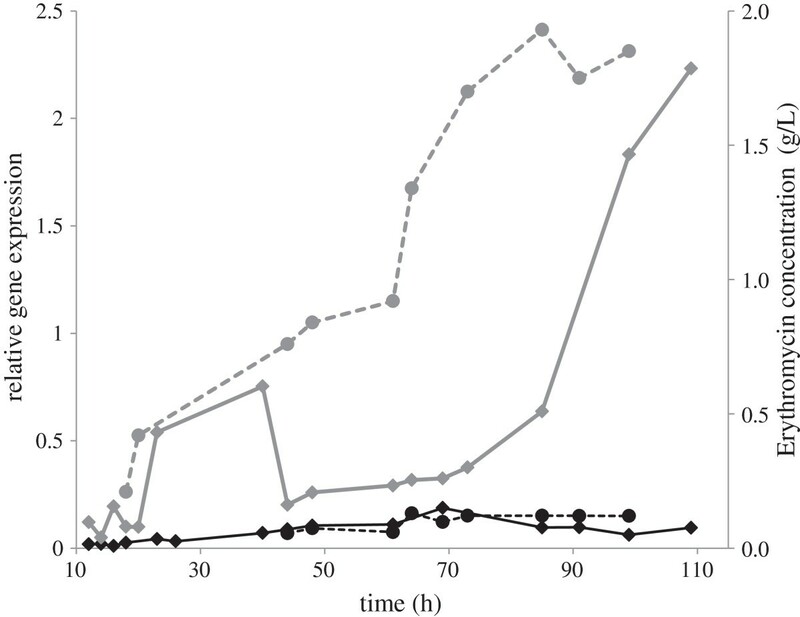 Interestingly, erythromycin productivity was restored to the levels of the ABE1441 high-producing strain, which coincided with the recovery of original sporulation capacity (Figure 4). In contrast, in strains which failed to regain sporulation capacity, erythromycin yield also remained at the level of SACE_5599-inactivated mutants. It is important to stress that decreased yields of the strains which did not sporulate on ABSM4 agar medium, were not caused by poor growth/biomass formation, as evaluated by the pH and packed cell volume (PCV) measurements of vegetative media before inoculating the production media (not shown). Therefore, the effect of SACE_5599 on erythromycin biosynthesis seems to be closely related to its role in morphological differentiation, similarly to what was observed in the case of the bldD gene . It was one of important objectives of our work to evaluate the biotechnological potential of regulatory genes, known to influence erythromycin yield, in an effort to obtain further improved S. erythraea strains. Therefore, in parallel with overexpression of the newly identified SACE_5599, we also overexpressed in the NRRL 23338 strain the bldD gene, for which the positive regulatory role in erythromycin biosynthesis was demonstrated earlier . For expression of bldD we used the same vector-promoter system (plasmid pABE21) as described above for expression of SACE_5599 and fermentation was carried at shake flask level as described above (Table 1). Indeed, bldD-overexpressing strains produced on average approx. 30% more erythromycin compared to the wild type strain (Figure 4), resulting in similar yield improvement as observed with SACE_5599 overexpression. Interestingly, when bldD was over-expressed in trans in the high producing ABE1441 strain, the yield of erythromycin was not further increased, but in contrast, was slightly decreased compared to the original ABE1441 strain (Figure 4). Improving the understanding of regulatory elements involved in erythromycin biosynthesis in S. erythraea remains a challenging task because no regulatory genes are present inside the erythromycin gene cluster. Analogously as demonstrated for bldD, other potential regulators influencing erythromycin biosynthesis, might be located in other regions of the chromosome of S. erythraea and affect multiple physiological processes simultaneously, e.g. morphological differentiation or other metabolic pathways, in addition to transcriptional control of erythromycin biosynthetic genes. The difficulty of identifying key regulatory genes, crucial for improvement of erythromycin yield, is reflected by the fact that among about 7000 predicted ORFs in S. erythraea genome 15.5% are putative regulatory genes . Even a recent comparative genomic analysis of the natural and industrial erythromycin over-producing strain identified 40 genomic variations affecting genes related to the regulation of transcription and translation processes . In this work we have identified a putative regulatory gene/protein SACE_5599, based on a comparative proteomic analysis of erythromycin high-producing ABE1441 and WT S. erythraea strains, cultivated in industrially based medium. After bldD, SACE_5599 is only the second putative regulatory gene identified to date to affect erythromycin yield. This finding shows a promising potential of the non-gel based proteomic techniques to detect and identify differentially expressed regulatory proteins, which are generally of extremely low abundance. The results of gene inactivation and overexpression experiments carried out in this work showed that this gene is indeed involved in the increased yield of erythromycin in the industrial high-producing ABE1441 strain. In addition to decreasing erythromycin yield, inactivation of SACE_5599 also resulted in the morphological phenotype with drastically reduced sporulation of the resulting mutant strains. While levels of expression of SACE_5599 are clearly related to erythromycin biosynthesis, an important question remains about the mechanism of action of this putative regulatory protein as well as of its homologues in other actinomycetes. Considering the high predicted pI value of SACE_5599 and reports of putative regulatory roles of its homologues in other actinomycetes it can be speculated that SACE_5599 acts as transcriptional regulator by binding to specific DNA/RNA sequences . Interestingly, a profound effect on morphological development of S. erythraea was observed when bldD, the first identified regulatory protein involved in the regulation of erythromycin biosynthesis , was inactivated . Our results thus support the idea that the regulatory network involved in morphological differentiation interconnects very closely with erythromycin biosynthesis. Moreover, the propensity of aerial mycelium formation seems to correlate well with erythromycin production among spontaneously rifampicin-resistant mutants of the NRRL23338 strain , suggesting that from the regulation aspect, morphological differentiation and erythromycin biosynthesis are very closely related phenomena. In another recent study, the bld phenotype of bldD-inactivated strains was shown to be overcome by inactivation of the SACE_7040 gene, a regulator of the TetR family. Unfortunately, it was not reported whether re-established morphological phenotype also led to the return of original erythromycin yields in that double mutant strain . Another recent study revealed the role of the SACE_0012 gene in morphological differentiation of S. erythraea, however, in this case, no significant change in erythromycin productivity was observed in the SACE_0012-inactivated strains in spite of the observed early aerial hyphae formation of this strain . In an attempt to analyse how our results correlate with the previous work of other groups in S. erythraea and to gain a more comprehensive insight into the roles of SACE_5599 and bldD, we took a closer look at the data of recent high-throughput studies, carried out with S. erythraea. In particular, we analysed how the transcription of these two regulatory genes correlated with erythromycin biosynthesis at different phases of cultivation. In most studies in the past, cultivation of S. erythraea was carried out in soluble non-industrial media. In contrast, we made particular effort to develop media and bioprocess parameters closely resembling the industrial conditions. Interestingly, the SACE_5599 gene was one of the few genes that were not included in the microarray design of most previous transcriptomic studies [9, 12, 34, 37], therefore no information is available about its expression profiles in these studies. In contrast, transcription levels of bldD were studied in most of the published studies. In an initial attempt to characterize transcriptional changes in S. erythraea WT strain during different growth phases, the expression bldD (SACE_2077) was found to decrease during transition from initial growth phase (phase A) to growth slowdown phase (phase B), similarly to expression of erythromycin biosynthetic genes . However, when the same transcriptome data was later reinterpreted the bldD gene was not categorized into the same co-transcriptional module as the erythromycin biosynthetic cluster . Interestingly, when different rifampicin-resistant mutants of S. erythraea were later profiled by DNA-microarrays, bldD transcription levels were lower in strains with higher transcription of erythromycin biosynthetic genes and increased erythromycin yield . Moreover, in this study bldD levels were higher in strains with decreased erythromycin yield, thereby not suggesting a close link between the BldD expression and erythromycin yield. In contrast, a spontaneous streptomycin-resistant mutant containing a mutation in the rpsL gene (encoding the S12 ribosomal protein) showed a markedly increased erythromycin yield which correlated with an increased BldD expression at the late stages of the bioprocess . In a further comparative study transcriptional profiles of the NRRL23338 and an erythromycin overproducing Px strain were evaluated . In this study the erythromycin-overproducing strain showed higher levels of bldD transcription compared to the WT in the initial phases of the fermentation process. However, after 35 h bldD transcript levels were comparable in both strains, whereas most prominent differences in erythromycin productivity between the two strains were observed between the 48 h and 72 h time point. An RNASeq analysis of S. erythraea transcriptome was also carried out recently, which permitted us to analyse expression of SACE_5599 as well as bldD. Indeed, transcription of some of the genes from the erythromycin cluster was found to correlate well with SACE_5599, while no correlation was apparent with bldD. During the preparation of this manuscript, another comparative genomic and transcriptomic analysis of the WT and high-producing S. erythraea E3 strain was reported . Importantly, industrial growth media were used for S. erythraea cultivation in this study and SACE_5599 was included in the microarray design. Similarly to our observations SACE_5599 showed significantly higher expression levels in the high producing strain, compared to the WT in all time points of the fermentation process. In contrast BldD expression was significantly decreased in the high producing strain. In summary, different studies report different degree of correlation between expression levels of either bldD or SACE_5599 and erythromycin biosynthesis. There are at least three possible reasons for these discrepancies. Firstly, it is reasonable to expect that the preparation of total RNA or construction of microarrays can vary significantly, thereby influencing the outcome on transcriptional analysis. Secondly, different media and cultivation conditions were applied, which clearly have effect on secondary metabolism and differentiation. Finally, the discrepancies between different studies might be related to the fact that due to the lack of pathway-specific regulation, erythromycin biosynthesis is regulated directly through globally acting regulatory elements which at the same time also control morphological differentiation of S. erythraea. Therefore, differential expression of multiple regulatory genes might play a key role in increased erythromycin yield in each individual high-producing strain, considering that every strain was developed through an independent media and process development in combination with classical mutagenesis and selection programs. Further experiments are necessary in order to elucidate regulatory mechanisms by which SACE_5599 as well as bldD can affect erythromycin yield. Interestingly, after the regulatory network of BldD orthologue has been studied in significant detail in Streptomyces coelicolor, the actinomycete model organism [23, 24, 42, 43], a more complex relationship between BldD expression and erythromycin biosynthesis in S. erythraea has been recently suggested . Regardless of the poorly understood underlying regulatory and metabolic pathways, the S. erythraea production strain and bioprocess for production of erythromycin have been improved for over 50 years. A significant increase in erythromycin yields has been achieved, compared to the WT strain. However, considering the annual world production and commercial importance of erythromycin and its semi-synthetic derivatives, current yields remain relatively low in comparison to other antibiotic production technologies, e.g. tetracyclines or penicillin . Therefore, there is a clear commercial incentive to further improve erythromycin production technology. In addition to the classical methods of random mutagenesis and selection, which have been already exhausted to great extent, metabolic and biosynthetic engineering are now expected to have a key role in future improvement strategies. For example, engineering the methylmalonyl-CoA mutase (mcm) enzymatic activity has been shown to have good potential for increasing the flux through the feeder pathway of methylmalonyl-CoA, the main precursor of the erythromycin polyketide chain. Inactivation of mcm lead to yield increase in carbohydrate-based medium and overexpression of the mcm operon enabled significant yield increase in an oil based medium [11, 45]. To our knowledge, improvement of erythromycin titres by manipulation of expression of regulatory genes has so far not been demonstrated. In this work we show that using a comparative proteomic approach combined with an extra effort to cultivate S. erythraea in conditions simulating the industrial setting, regulatory genes relevant for increasing erythromycin yield in genetic engineering approaches can be identified. Interestingly, SACE_5599 could also have been envisioned as a possible candidate gene based on a very recent comparative transcriptomics study, also carried out industrial media . Our results thus open new possibilities for increasing erythromycin yields by overexpressing globally acting (pleiotropic) regulatory genes involved in key processes of development and differentiation. Specifically, approaches aimed at achieving higher levels or optimum temporal control of in trans expression of SACE_5599 could result in further improved yields. Further on, other candidate regulatory genes in S. erythraea genome, identified by recent omics analyses, carried out in industrial conditions should be evaluated for their potential of further improvement of the yield. Particularly, regulators providing further yield increase in industrial high-producing strains would be desirable for biotechnological applications. In this way, manipulation of expression of regulatory genes will become a complementary strategy to manipulation of metabolic genes which has already led to significant improvements of erythromycin yields. In conclusion, we have identified a new putative regulatory gene SACE_5599 in S. erythraea that influences sporulation during the life cycle of this actinomycete and importantly affects erythromycin yield of the WT and high-producing S. erythraea strains. While the detailed regulatory mechanisms of this protein remain to be elucidated, we have observed that erythromycin biosynthesis and final yield in S. erythraea are strongly interrelated with regulatory networks involved in morphological differentiation. We have also shown that overexpression of SACE_5599 and bldD gene (SACE 2077) can improve the yield of erythromycin in the S. erythraea WT strain, suggesting that modulation of expression of globally acting regulators may lead to improved producers of polyketide natural products. Importantly we have shown, that omics approaches are valuable tools to identify industrially relevant regulatory genes, however, it is of key importance that samples for omics analysis are collected in conditions which simulate real industrial setting. The S. erythraea NRRL23338 type strain and ABE1441 industrial overproducing strain, obtained by iterative methods of classical mutagenesis and selection, were propagated on ABSM4 agar plates (1% corn starch, 1.1% corn steep liquor, 0.3% (NH4)2SO4, 0.3% NaCl, 0.3% CaCO3, 2% agar) or R5 agar plates  for 14-days at 30°C. Laboratory scale fermentation in liquid culture was carried out for estimation of erythromycin productivity. Seed cultures were prepared in the ABVM1 medium (3% corn steep liquor, 3% sucrose, 0.4% (NH4)2SO4, 0.6% CaCO3) at 30°C and 220 rpm for 48 h at 6 mL or 40 mL of working volume in Falcon tubes or Erlenmeyer flasks. Erythromycin production phase was carried out in the ABPM8 medium (3.6% soybean flour, 3.6% corn starch, 0.24% (NH4)2SO4, 0.72% CaCO3, 0.5% soybean oil) inoculated with 10% (v/v) of the above seed culture. At time of inoculation 2% glucose and 0.67% n-propanol were added. Cultivations were performed at 5 mL or 25 mL working volume at 30°C and 220 rpm for 7 days. After 24 h of cultivation 1% glucose and 0.34% n-propanol were added. Apramycin (50 μg/ml) and thiostrepton (25 μg/ml solid and 5 μg/ml liquid media) were added to the solid and liquid media as required. Seed cultures for the cultivation in bioreactors were prepared as described above, using 400 ml of the ABVM1 seed medium in 2 L Erlenmeyer flasks. Fermentation experiments were carried out in 5 L Bioreactors (Sartorius) with 3.5 L of ABPM8 production medium, operated at 30°C, 1 vvm airflow and 350–900 rpm agitation. Bioreactors were inoculated with 10 vol.% seed culture. Dissolved oxygen concentration and pH were monitored using autoclavable electrodes (Hamilton). Dissolved oxygen was maintained above 20% with increasing agitation and aeration rate during the bioprocess. Foaming was controlled by automatic addition of antifoam. Samples for RT-PCR and proteomic analysis were taken during the bioprocess and stored at -80°C until analysis as described below. Transformation of S. erythraea strains was achieved by conjugation of pSET152  and pKC1132  based plasmid constructs from the E. coli strain ET12567 carrying the E. coli-Streptomyces conjugation facilitating plasmid pUZ8002, as described previously . Standard methods for isolation and manipulation of DNA were used [32, 46]. BlastP searches  were performed against the nr protein database of NCBI (http://www.ncbi.nlm.nih.gov) using amino acid sequence of SACE_5599 as query. Hits with E value < 10-5 were considered to be homologous and were aligned using ClustalW2 program with default parameters (http://www.ebi.ac.uk). Whole fermentation broth samples were centrifuged and washed three times with 50 mM Tris–HCl, pH = 7.2. Cells were resuspended in lysis buffer containing 7 M urea, 2 M tiourea, 4% CHAPS, 40 mM Tris, 65 mM DTT and complete protease inhibitor cocktail (Roche) and subsequently sonicated. Homogenate was centrifuged to obtain cell extract. Proteins in the cell extract were separated on a 12% precast SDS-PAGE gel (Lonza) and stained using Coomassie Brilliant Blue dye. Whole protein lanes were excised, sliced into bands and subjected to the standard trypsin digestion procedure as previously described . Peptides were extracted from the gel, and injected into nanoLC HPLC unit (Proxeon) coupled with Orbitrap LTQ Velos mass spectrometer (Thermo Scientific). Peptides were separated on a Picofrit C18 analytical column (New Objective) with a 90 minute linear gradient of 5-50% acetonitrile/0.1% formic acid. MS/MS spectra were generated using CID fragmentation of precursor ions generated in the MS scans. Protein identification and relative quantification by spectral counting was carried out using MaxQuant database search software  and species specific NCBI database. For the database search Methionine oxidation was set as variable and carbamidomethylation of cysteines was set as fixed modification. Expression of SACE_5599 gene was monitored in the time course of the fermentation process in WT, ABE1441 and in overexpression strains. For SACE_5599 primers (F: CTGGATCGTGGCCAACCT, R: GGGCGCCTCGACCTG) and TaqMan MGB probe (FAM- CTGGTCGGCTTCCTCC -MGB) were designed by Life Technologies (Assay by Design service). 16S rRNA primers, targeting SACE_8105, (F: ACTGAGACACGGCCCAGACT, R: AGGCTTKCGCCCATTGTG) and TaqManMGB probe (FAM-CTGCTGCCTCCCGTAG-MGB), designed in-house using Primer Express (Life Technologies), were used for normalization. RNA was isolated from 0.5 ml of fixated (ethanol:phenol 96:4) culture. After removal of the fixative, the pellet was treated with lysozyme (Sigma, 15 mg/ml) and proteinase K (6000U, Qiagen) in TE buffer for 10 minutes, followed by homogenization with a bead beater (FastPrep, Qbiogene) using Lysing Matrix B (Qbiogene) beads and RLT Buffer (550 μl, Qiagen). Lysates were centrifuged and supernatant was used for subsequent RNA isolation using RNeasy Mini Kit (Qiagen, Hilden, Germany) with following modifications of the manufacturer’s protocol: samples were washed with RW1 and RPE buffer twice and three-times, respectively. RNA was eluted with pre-heated (65°C) RNAse-free water following 5 minute incubation. To remove remaining genomic DNA, total RNA samples were treated in solution with Qiagen’s RNase-free DNase digestion kit (Qiagen, 0.5 U/μg RNA). Efficiency of DNase digestion was tested using RT- controls. RNA quantity and quality was checked using Nanodrop, gel electrophoresis and Bioanalyzer (Agilent) Reverse transcription and qPCR analysis of SACE_5599 and 16S rRNA was performed using LightCycler 480 as described previously . The standard curve method was used for relative gene expression quantification, and the transcript accumulation of SACE_5599 was normalized to 16S rRNA. 219 aa and 184 aa variants of SACE_5599 gene (Figure 3B) were amplified using S. erythraea genomic DNA as template. The shorter gene variant was amplified using the following primers: forward primer AAAATATCATATGAATTCGTCGGCCTGGTTCCTCGGTGAC introducing NdeI restriction site into the start codon and reverse primers AAAAATCTAGAATTATGCCCGGGCGACCAGTTGCCGGTGCT and AAAAATCTAGAATTAGGCGTAGTCCGGGACGTCGTACGGGTATGCCCGGGCGACCAGTTGCCGGTGCT for HA-tagging of the protein, in both cases introducing XbaI restriction site after the stop codon. The 219 aa gene variant was amplified using the following forward primer: AAAAACATATGGAACGCTCCGGTGAGGTGCTGGCG and the same reverse primers used as for the 184 aa variant of the gene. The PCR amplified genes were cloned into pSet152 vector into which the constitutive PermE* promoter  was previously cloned, thus creating series of pABE vectors (Table 1). The identity of the PCR products was confirmed by sequencing. As the 5’-UTR of the native ermE gene lacks obvious RBS, a variant of the promoter sequence containing RBS  was also assembled to achieve constitutive expression of SACE_5599. The bldD gene was amplified using S. erythraea genomic DNA as template using the following primers: forward primer AAAAAAACATATGGGCGACTACGCCAAGGCGCTGGG introducing NdeI restriction site into the start codon and reverse primer AAATCTAGACTCACTCCTCCCGGGCCGGGCGC introducing XbaI restriction site after the stop codon. As above, the PCR amplified gene was cloned into pSet152 vector with PermE* promoter and confirmed by sequencing. The obtained plasmid constructs were introduced into S. erythraea NRRL23338 strain using standard conjugation procedure  and the insertion of plasmid constructs into pseudo att site was confirmed by PCR. The obtained independent colonies were cultivated according to the above procedures and erythromycin yields were estimated by the microbiological assay. Gene disruption of SACE_5599 was carried out by transformation of the ABE1441 strain with pKC1132  based plasmid construct containing an 344 bp central region of the SACE_5599 gene (pABE110). The central region of SACE_5599 was PCR amplified using the following primers: d5599F AAAGAATTCGTCGGCCTGGTTCCTCGGTGAC containing EcoRI restriction site at 5’-end and d5599R AAAAAAGCTTTGGTCACCTGGATGGCGGGCATC containing HindIII restriction site at 5’-end. The PCR fragment was gel purified, digested with EcoRI and HindIII enzymes and cloned into pKC1132 vector opened with the same enzymes to generate pKC1132-d5599 plasmid construct (pABE110). The correct nucleotide sequence was confirmed by sequencing. The pKC1132-d5599 was transformed into the ABE1441 strain using standard conjugation procedure described previously  and SACE_5599 gene was inactivated through a single-crossover recombination event. Inactivation of SACE_5599 in 20 independent apramycin-resistant ex-conjugants was confirmed by PCR and sequencing. The obtained independent colonies were cultivated according to the above procedures and erythromycin yields were estimated by HPLC. Complementation of SACE_5599 in the mutant strain S. erythraea OP (ΔSACE_5599) was carried out by insertion of vectors containing the 219 aa variant of the gene under the control of PermE* promoter. The pABE112 vectors was constructed by inserting the thiostrepton resistance marker  into the MscI restriction site of the corresponding pSET152-derived vector (pABE106) containing the 219 aa variant of the SACE_5599 gene. After cultivation was completed, the pH of the broth was first adjusted to 9.5-10 and the broth was mixed with the equal volume of acetonitrile (1:1) for 40 min. After that 1 g NaCl was added per 5 g of broth, left to dissolve and the acetonitrile phase was then separated by centrifugation and applied onto the Nucleodur HTec C18, 3 μm (150 × 4.6 mm, Macherey-Nagel, Dueren, Germany) reversed-phase stationary phase HPLC column installed on the Thermo Finnigan Surveyor + HPLC system. Isocratic elution was applied with mobile phase prepared from 20% 50 mM K2HPO4 with pH adjusted to 9 with diluted phosphoric acid and 80% acetonitrile. After injection of 10 ul of the sample solution, the HPLC system was operated at a flow rate of 1 ml / min, with total the run time of 30 minutes. The column temperature was set at 60°C and the detection wavelength at 206 nm. Reference substance erythromycin A was obtained from the European Pharmacopoeia and was 98.4% pure. Standard solution was prepared by dissolving 5 mg of erythromycin in 5 mL of solvent. All chemicals used were HPLC-grade. The titres of erythromycin produced by S. erythraera NRRL23338 strain and its genetically modified variants were determined using a conventional Pharmacopoeia bioassay method (European Pharmacopoeia 5.0). As standard commercially available eythromycin (Calbiochem) was used and Bacillus subtilis NRRL B-765 strain was grown as test organism. Samples were extracted in acetonitrile and 60 μL of properly diluted extracts were transferred in cylinder halls on ABA agar test medium (Biolife) which contained overnight Bacillus subtilis culture. The plates were incubated for 14 – 16 h at 37°C. Thereafter, sizes of inhibition zones were measured and erythromycin concentrations calculated according the standard curve. The method has a linear response in the range from 1 mg/L to 20 mg/L and all samples were diluted accordingly. Yields of erythromycin were calculated with SAS/STAT software using means and the univariate procedure to test the normality of distribution. Using the GLM model, data were calculated as least mean square and are presented as an average change observed from all experiments when comparing least mean square values to the wild-type control least mean square value of each experiment. Cell-free protein extracts of S. erythraea were prepared by washing the cells in 100 mM K-phosphate buffer, pH = 7.4 twice, resuspending in the same buffer containing complete protease inhibitor cocktail (Roche) and subsequent sonification. A total of 50 μg of proteins were boiled in Laemmli’s sample buffer. Proteins were separated on a 15% SDS-PAGE gel and transferred to a nitrocellulose membrane. Immunodetection was performed with monoclonal rat anti-HA primary antibodies (Roche) and horseradish peroxidase conjugated anti-rat secondary antibodies (Calbiochem). The antigens were visualized with chemoluminiscence detection system (GE Healthcare). We would like to thank the Government of Slovenia, Ministry of Economy for the award of the “KC Brin competence centre” grant which provided most of the funding for this study (VM, MT, MH, MP, ŠB, ŠF, JH, HP, GK, RV, MF, BT). BK and KK are grateful for the award of the “young researcher” funding by Slovenian Technology Agency (TIA) and MH appreciates the funding awarded by the University of Ljubljana and the European Social Fund. This work was also supported by the Slovenian Research Agency (ARRS), project No. : J4-2195 to PJ, J4-4149 to ŠF, L4-7117 to HP and grant P1-0140 awarded to BT. We would like to thank Neža Turnšek and Katja Stare for excellent technical assistance. JH, ŠF, HP and GK are shareholders in Acies Bio, Ltd.
BK and VM carried out cultivation of S. erythraea in shaker and fermenter level with sampling and analysed the morphology of transformant strains. VM, MT and MH carried out molecular cloning, conjugation of S. erythraea, genetic analysis of ex-conjugants and western blot analyses. KK and PJ participated in preparation of cell extracts for comparative proteomic analysis. JH set up and carried out analytical methods for erythromycin determination. ŠB analysed qPCR data, MP interpreted the data in the context of other high-throughput studies, MP, ŠB and KG participated in study design and helped to draft the manuscript. RV, MF and BT performed mass spectrometry analysis and proteomic data processing and evaluation. ŠF was involved in study design, data interpretation and statistical analysis. HP and GK were involved in the conceptualization and design of the study, data interpretation and manuscript preparation. All authors read and approved the final manuscript.